Packed hallways at Selbyville Middle School are the norm, according to school district officials. Selbyville Middle School and two other schools will begin using modular classrooms this autumn. If voters pass the May 7 referendum for new construction, then students should only be using outdoor classrooms for about five years. If not, that time could be indefinite. When the Indian River School District in 2000 passed a referendum for two new schools and a bunch of renovations, administrators hoped to never put students in portable classrooms again. Fast-forward to 2019, and there simply isn’t room in the public schools for the students they educate every day. Because schools are so overcrowded, the school board agreed on March 25 to begin leasing six trailers for the 2019-2020 school year. That includes two classrooms at SMS, two classrooms at North Georgetown Elementary School and eight classrooms at Sussex Central High School. Each trailer provides two classrooms. IRSD can only get a five-year lease. 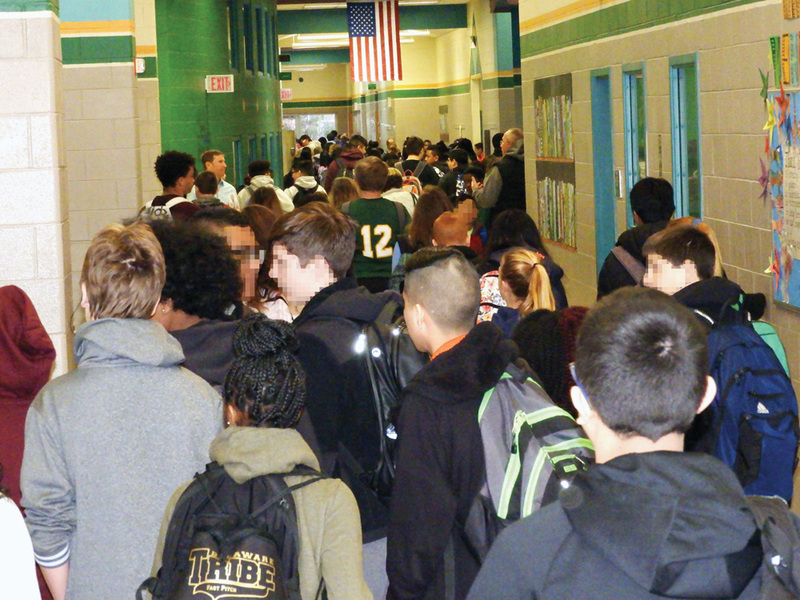 Already when students aren’t stuck in narrow hallways, shuffling instead of walking, they run for to the lunchroom, or risk getting stuck standing in line with little time to actually eat lunch. The portable classrooms will cost a total $837,000 for five years ($139,530 times six trailers, each costing about $130,000, plus another $10,000 each for phone, electric, outdoor walkways, P.A. system and more). Outdoors classrooms physically remove students from the school. As Delaware State Police Troop 4 commander, Board Member Rodney Layfield has repeatedly highlighted the safety concerns of having students physically separated from the school, whether in lightning storms or active shooter events. “It’s more critical that we pass the referendum so we don’t have this continuing,” said Board Member Gerald “Jerry” Peden Jr.
That overall cost for the trailers will surpass $1 million in two years, since SCHS will need another eight classrooms (four more units). “That comes out of our operations funds, our current expense. We get no extra funding from the State to help support these classrooms,” Steele said. Having tightened their belts substantially for the past few years to rebuild a reserve fund, IRSD will “quite possibly” need to dip into the reserve funds they’ve saved. If the May 7 referendum passes, the IRSD will aim to finish construction in five years, to get students back indoors. The IRSD is asking for less funding in the May 7 referendum than they did in February, when their first attempt failed, 55-45 percent. The May 7 referendum would allow the IRSD to borrow money to build a new Sussex Central High School; an eight-classroom addition at Indian River High School; and a four-classroom addition at Selbyville Middle School. The State of Delaware has already OK’d the proposal and would pay 60 percent of the bill. With voter approval, the referendum would result in a maximum possible property tax increase of $68.96 for the average district property owner. That increase will be phased in over a four-year period, then decrease back to $0 as the debt is repaid. The requested permanent tax increase for ongoing expenses related to the proposed new school spaces was dropped for the May 7 referendum. It would have added $18.59 to the average property owner’s annual tax bill. The IRSD is also developing new ways to educate the community on the issues surrounding to the referendum: photos and video of the overcrowding, long cafeteria lines and uncomfortably tight hallways. In addition to the student crowding, the shortage of space also means about 35 teachers work from portable carts instead of their own classrooms. The administration, Steele said, is also grateful that the teachers’ union, the Indian River Education Association (IREA), unanimously agreed to support and advocate for the referendum. Passage of the single question on the referendum would mean that, with some creative shifting, one new building could alleviate overcrowding at multiple schools. Voting on Tuesday, May 7, is from 7 a.m. to 8 p.m. People do not need to pre-register to vote. District residents who are U.S. citizens and 18 or older are eligible to vote at their choice of school: East Millsboro Elementary, Georgetown Elementary, Indian River High, Long Neck Elementary, Lord Baltimore Elementary or Selbyville Middle. Absentee ballots are available by mail until noon on May 3 and in person until noon on May 6. Affidavits for absentee ballots are available at all district schools. For more information, contact the Department of Elections at (302) 856-5367 or https://electionssc.delaware.gov/school_absentee.shtml. For more information about the referendum, contact Indian River’s Referendum Hotline at (302) 436-1079 or visit the district’s special referendum website at www.irsd.net/referendum.